Are you planning to attend InterAXions 2019? If you are planning to attend and have yet to register and/or book a hotel room, Register Now & Book Your Room Today! Hotel rooms have been booking up fast and the deadline to book at the discounted hotel rate is around the corner on April 16. 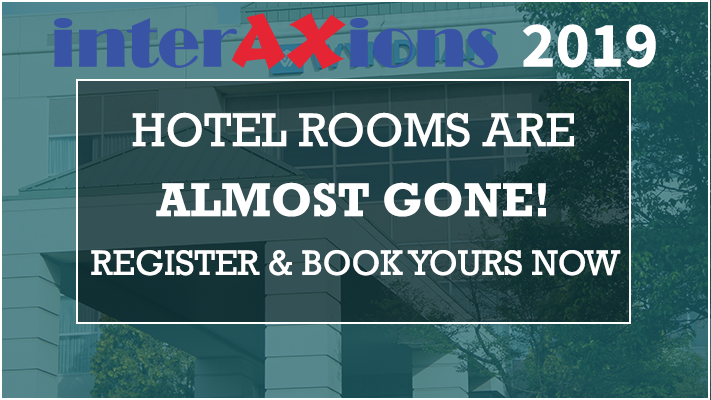 In order to book a room for InterAXions 2019, you must be a registered conference attendee. Once registered, you will be sent additional information and forms to fill out in order to make reservations. These rooms are available on a first-come, first-served basis so we recommend registering and booking your hotel room NOW. Note: We have a limited number of rooms in our contracted block at the Wyndham Hamilton Park Hotel and Conference Center so we cannot guarantee room availability at this hotel. We do have an overflow hotel if you are unable to get a room at the Wyndham. It's hard to believe, but we're celebrating 25 YEARS of InterAXions in 2019! As we look back on the last quarter of a century, we're excited to plan for what's to come - that's why we decided on our theme, "Defining the Future." We want to know: how would you define the future of Chempax and eChempax? Find out how to let us know a bit later in this post. For those new here, you may be wondering, "What is InterAXions?" InterAXions is Datacor’s premier annual user conference. This unique three-day educational event brings together over 300 of Datacor's customers and the ENTIRE Datacor staff to learn and share ideas with each other. It is the “must attend” event for every Chempax and eChempax user! We are excited to officially announce that our 25th annual user conference will be taking place May 14-17, 2019 at the Wyndham Hamilton Park Hotel & Conference Center in Florham Park, NJ. Be sure to not miss this highly rewarding educational and networking experience. What Do You Want to See at InterAXions? Please take a moment to complete this quick 2-3 minute survey and let us know which session topics you wish to see covered at InterAXions 2019. Your feedback is greatly appreciated and will help our teams create a customized agenda suited to your training needs. By filling out the survey, you will have a chance to WIN A FREE SUITE UPGRADE at InterAXions 2019. All surveys must be completed and submitted by November 16, 2018. Be sure to subscribe to this blog below to always get the latest updates and information on all things InterAXions! We will continue to post updates and provide you with some handy guides. Please feel free to reach out to us by leaving comments and asking questions below. We hope you’ll subscribe to our blog and stay in touch!